ask her to find me some random item, she'll find it within a week. gene too and she found these two fun items for me a few weeks ago. 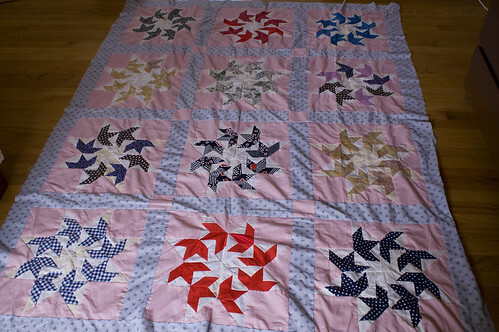 First, an old twin-sized quilt top (complete with batting and backing fabric). 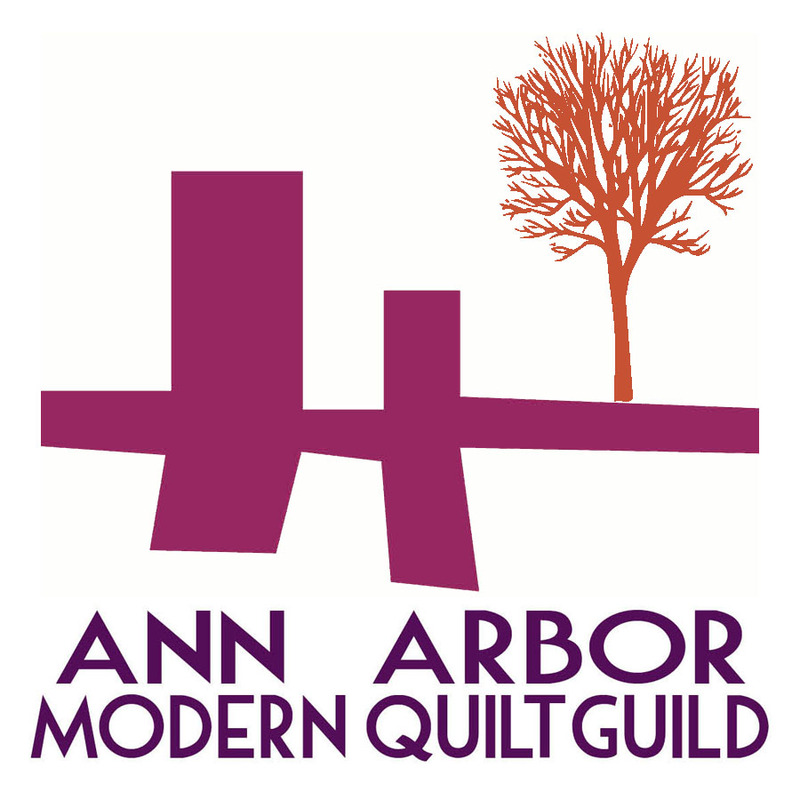 binding this top into a quilt soon. this is another fiber project that I don't have time for, I realize). 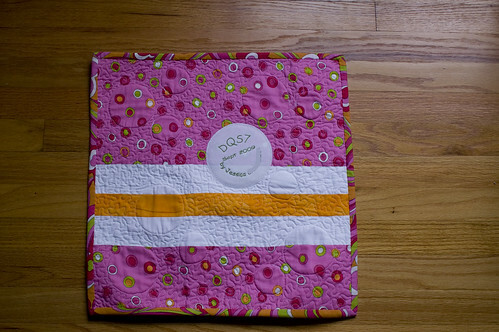 I received this lovely quilt in the mail last weekend from my swap partner, Jessica, of The Bossy Quilter. 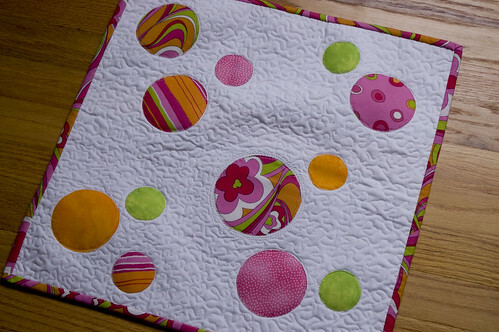 I love the design of the quilt...I've been really into circles lately, but too intimidated to try them myself. She included an adorable set of notecards, too. I will definitely be using these for correspondence soon. 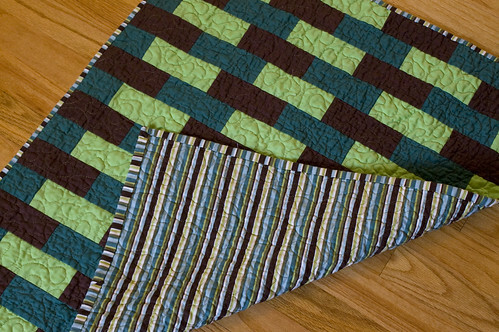 Her quilting is so nicely done. She stippled in the white space and left the patterned fabric untouched. The circles really pop in real life. 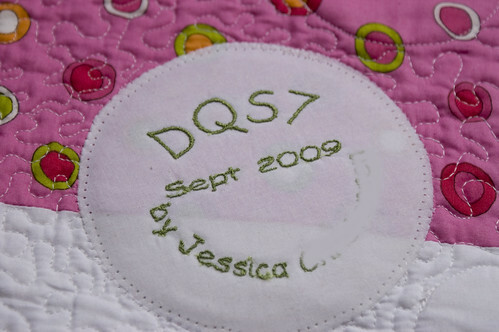 You can read a little bit more about how she did the quilt in her post, here. And, isn't her tag on the back so cute? I think an embroidery machine would be a really fun tool to have. Thanks so much for the awesome quilt, Jessica! I love it! I made this baby quilt a few weeks ago, but had to wait until after the shower for the big reveal. 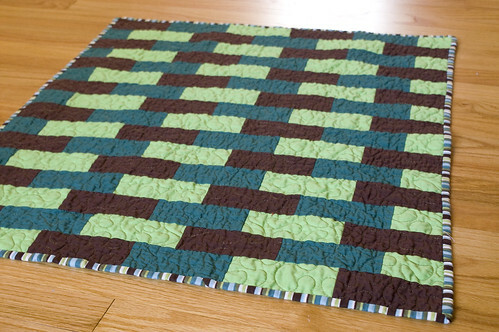 This quilt is for our friends who are having a baby boy next month. I based the colors off of their baby bedding, which is a teal, brown and green safari theme. I knew I wanted to make a brick road quilt, so I cut out rectangular blocks (2.5"x5") and arranged them in this geometric pattern. 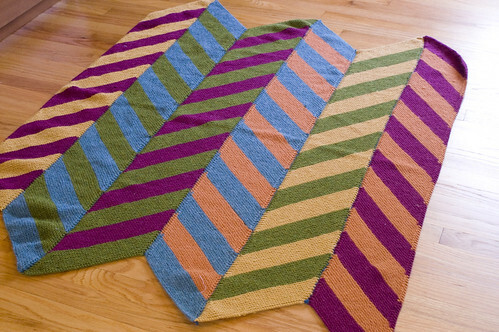 I used 1/3 yard of each solid and then 1.5 yards of the stripes for the backing and binding. The final quilt is about 32"x38" (but I'm totally guessing because I forgot to measure it when I was finished). Jon and I started dating six years ago today. To celebrate, we went back to the place where we became "official" and got engaged to reminisce. Six years has flown by and we're still having as much fun being together as we did in those first few months. I had a change of heart in August and picked it up again to finish what I've started. 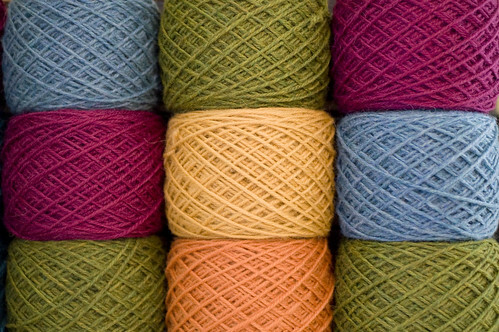 While the garter stitch does get old after a while, this is the best kind of tv knitting! 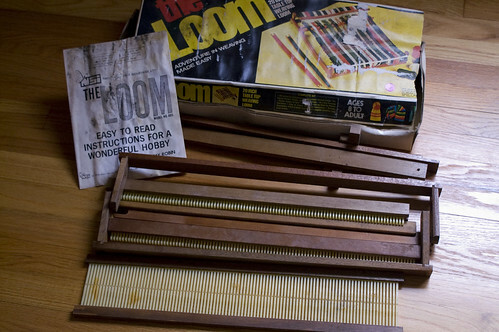 I think we watched Lost, Dexter and The Wire while I knitted away on this. 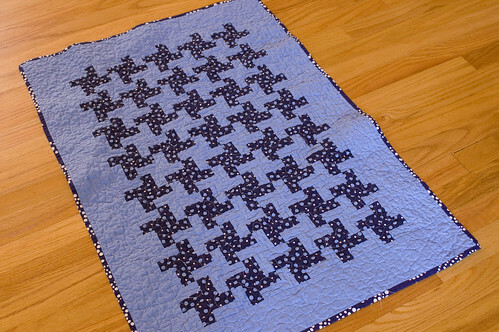 Here's a sweet little quilt that I made for a friend of mine from high school who is expecting a boy this October. 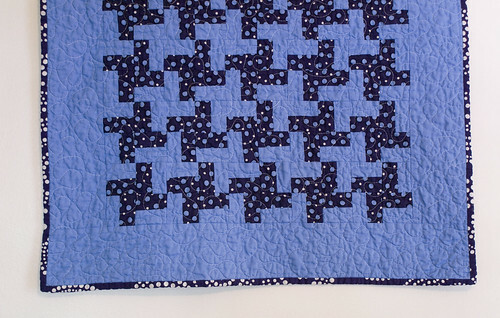 I knew that she was using traditional colors in her baby's room, so I went with baby blue and navy for this quilt. 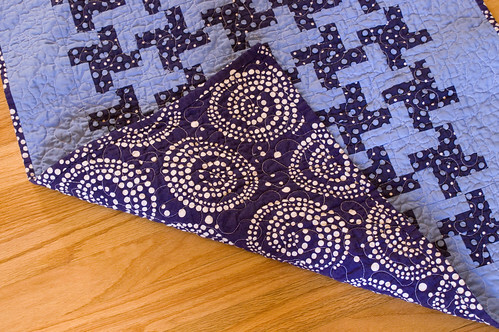 The blocks are 4" square after sewing and the sashing is 4" wide. The final quilt is 28" x 48". 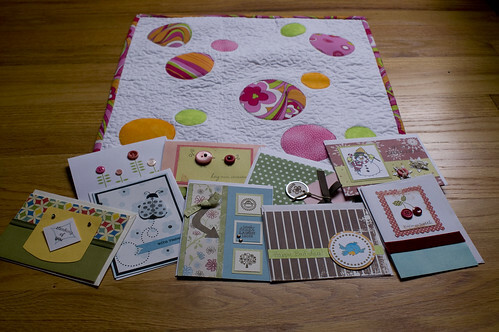 I am starting to get spoiled making smaller doll quilts and baby quilts. 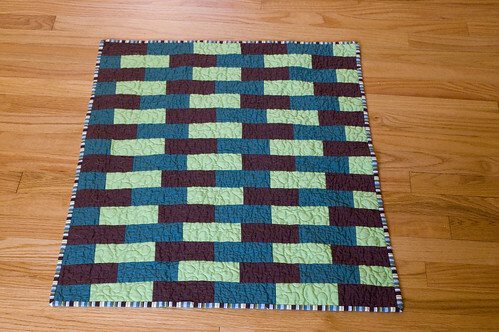 It's so satisfying to be able to finish up a quilt in a few hours...maybe I'm getting quilting ADD? !